Manufactured from high quality carbon steel, our range of Viking Helmet is characterized by high durability. Classy designs of our Viking Horned Helmet provide a traditional look to the interiors. 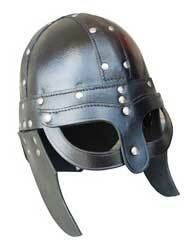 Our Leather Viking Helmet is available in various designs and sizes to match every kind of decors. We are well reckoned as one of the major Warrior Viking Helmet exporters based in India.